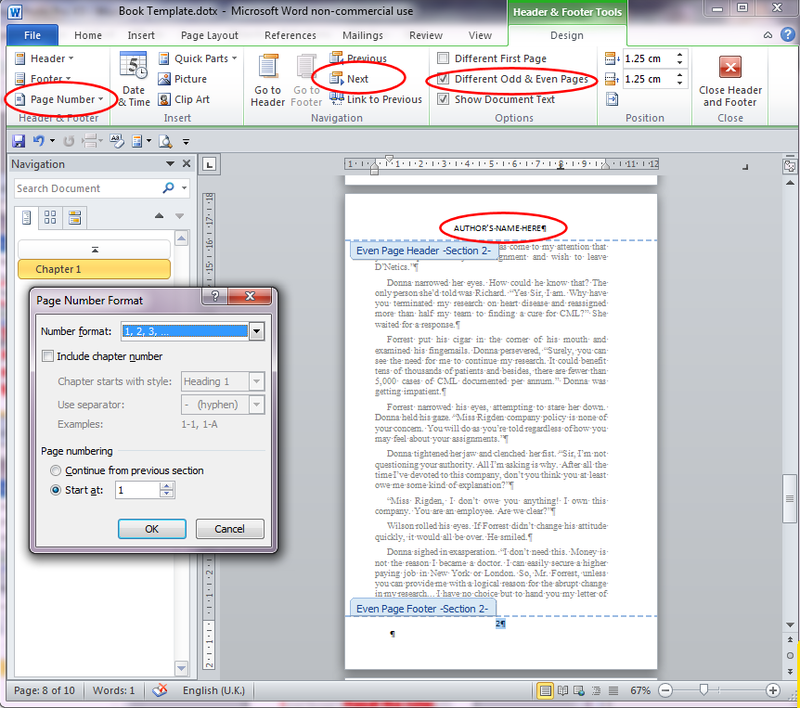 Like most authors, I use Microsoft Word and rapidly discovered one of it’s limitations. Word insists on starting any new document on a left hand page in a two page layout. There is nothing you can do to change this. Microsoft tell us that Word isn’t a publishing program and apparently expect us to import Word documents into a program such as Publisher before printing. Now that, for us authors, is the last thing we want. We want a single program on which to create our work and format it for printing. Word can be made to do it – almost. 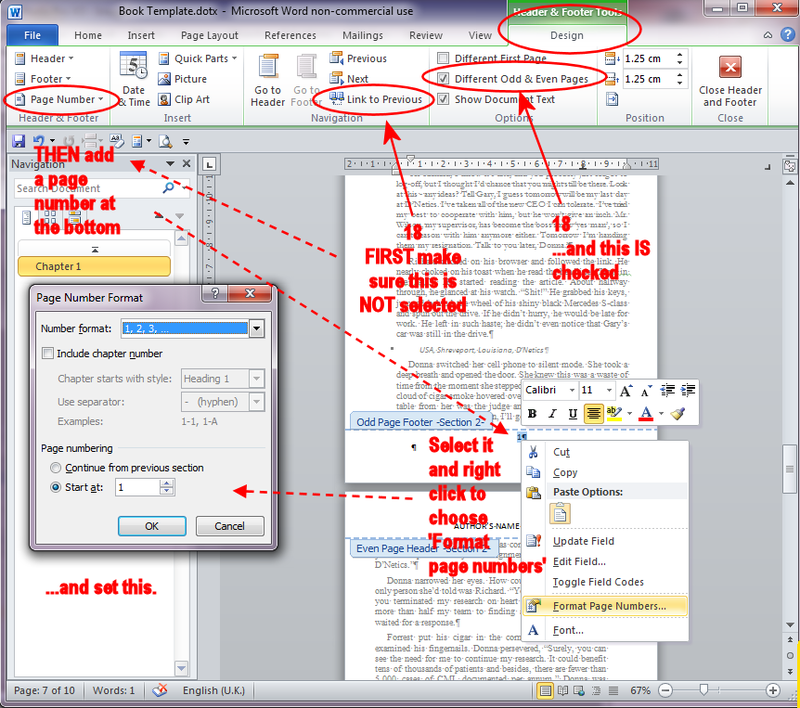 So this is how to set up Word 2010/2007 to produce a layout suitable for self publishing through Amazon’s Create Space publishing or Lulu. First. 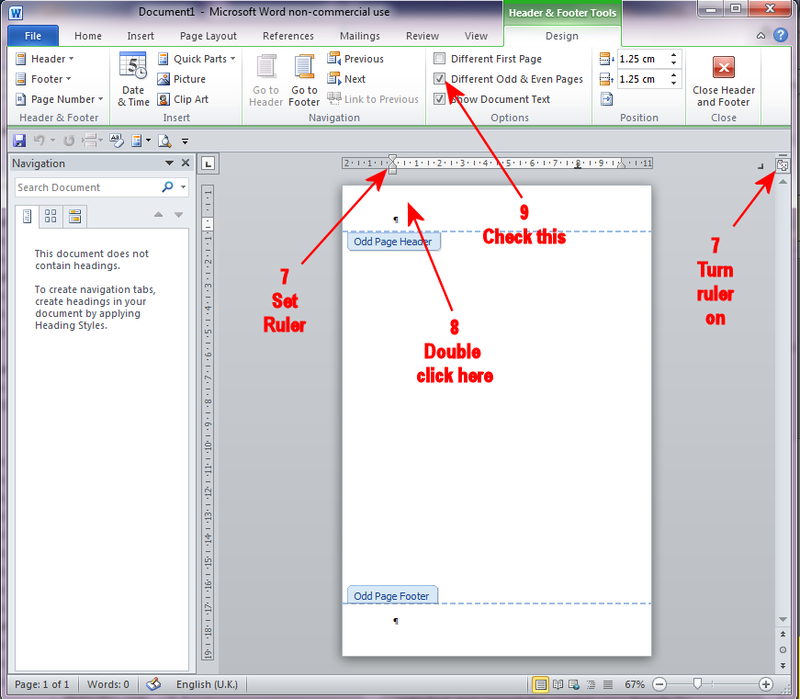 If you have an existing correctly formatted document then create a new document using that existing document. It will be a lot quicker. Using the ‘Paper’ tab, select what size pages your book will have. I use a custom size of 13.33 x 20.32 cm (5.25 x 8 inches) which is one of the standard book sizes. Your self publishing firm will tell you what standard sizes are available. I suggest you take a trip to your local library or bookstore and measure a few books too. Still in the ‘Page Setup’ window, on the ‘Margins’ tab select a top margin of 2 cm; bottom margin of 2.54 cm; inside margin of 1.27 cm; Outside margin of 1.0 cm; gutter of 0.95 cm; Gutter position Left (greyed out); Portrait; Multiple pages should Mirror margins; Apply to Whole document. This setup is good for a book of up to 600 pages. If you have less than 400 pages you can reduce the gutter and if you have more than 600 pages you’ll need to increase the gutter. For those who don’t know ‘gutter’ is a printer’s term for extra space added to the fold of a book which allows text to be read easier. Still in the ‘Page Setup’ window, on the ‘Layout’ tab select Section start New Page; Check in the Header and footers tab Different odd and even; Un-check Different first page; set the header and Footer to 1.25 cm from the edge; Under Page select vertical alignment Top. Then click OK. Turn on the ruler and set it as shown in the image above with no indents. Check ‘Different Odd & Even Pages’. You should now see ‘Odd Page Header’ at the header and ‘Odd Page Footer’ at the footer. The next page will be your main title page where you put the title, the author. I also add at the bottom the location and year of writing. Format this page as you wish it.At the end of the page insert a Page break . John and Sheila Chapman have asserted their right under the Copyright, Designs and Patents Act 1988 to be identified as the authors of this work. Add a page break at the end of this. Your next page will contain any acknowledgments you wish to make or will be blank. Add a Page break then a Section Break (Odd page) at this point. The ‘Section Break (Odd Page)’ is the crucial step! Note – Inserting a section break (any type) will add a little extra space before the next heading – this is normal practice. Subsequent headings won’t have this extra space. You are now ready to start the text of your book, to reset the ruler, to add a page header and a footer with page number 1. If your book has contents pages add them at this point. Contents pages should always be an even number of pages so add a page break if needed then a ‘Section Break (odd page)’ so that Chapter 1 of your book always appears on a right hand page. At the top of the Chapter 1 page (or first contents page if you have one) double click the header area. In the Navigation section of the Header & Footer toolbar make sure ‘Link to Previous’ is NOT selected. 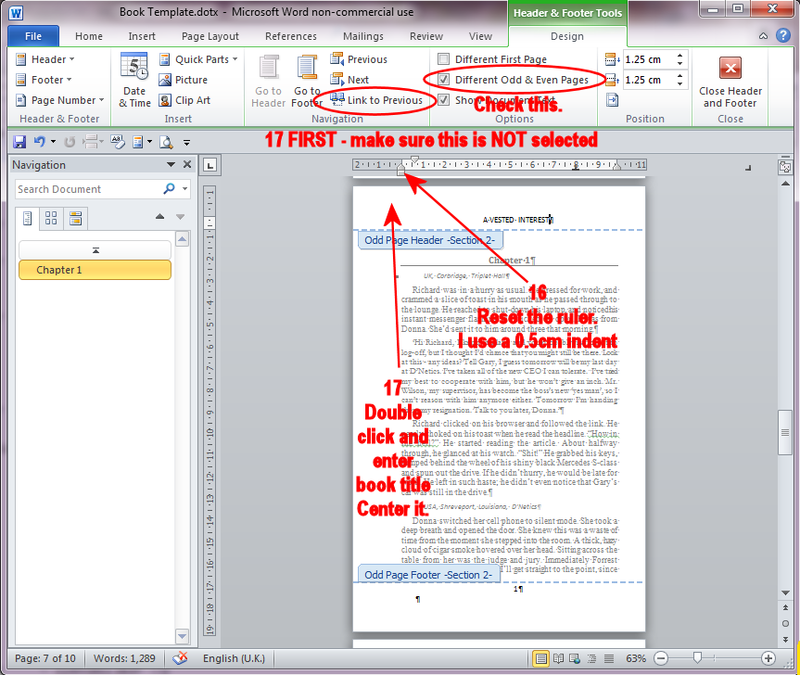 make sure Different Odd & Even Pages IS checked then add the book title in Capitals. Center it. Double click the Footer area of the page (or click the Footer button on the toolbar) Use the Page Number button to add a page number either centered or at the right. Format the page numbers so that they start at ‘1’ (Right click the number to find ‘Format Page Numbers…’). In the Navigation section of the Header & Footer toolbar click ‘Next’. In the Navigation section of the Header & Footer toolbar again make sure ‘Link to Previous’ is NOT selected. In the Header add in capitals the author’s name and center it. In the footer section again make sure ‘Link to Previous’ is NOT selected and add a centered page number at the bottom. Select and right click the number and choose Format Page Number. It should be set at ‘Start at 1’. The actual page will show page 2. 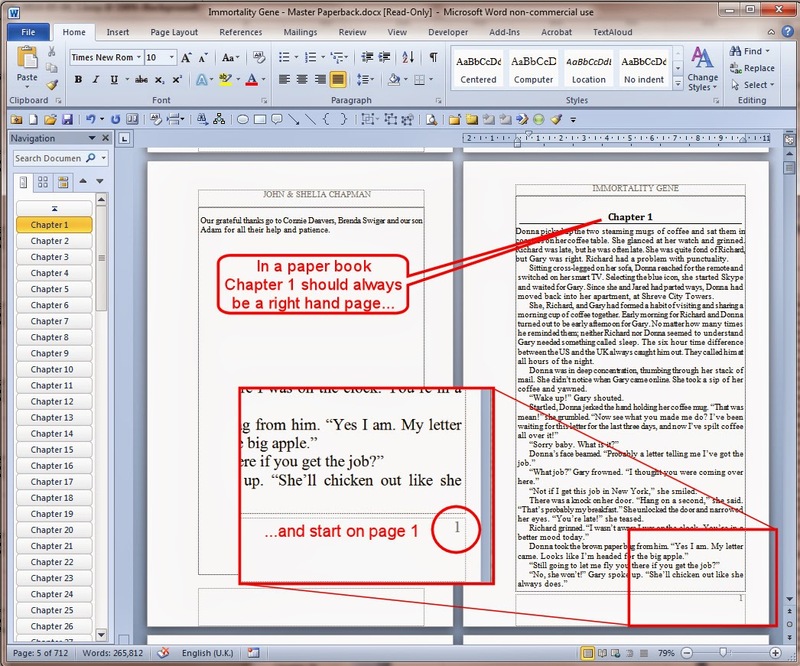 You should now find that from your ‘Chapter 1’ the pages will be displayed on the correct side in ‘Print Layout’ view. If you Add the ‘Print Preview Edit Mode’ button to the Quick Access toolbar (22) you’ll find on using it that all pages (in a two page view) are shown on the correct sides. Extra blank pages will be inserted to make sure the main title page and Chapter 1 pages are on the right hand side. Following chapters should each start on a new page but usually it is not important that they should start on right hand pages. If you have a short book of less than 80,000 words though you might like to insert a ‘Section break (odd Page)’ rather than a standard ‘Page Break’ to force this. A word of warning about something which MS Word gets wrong and which can cause problems with CreateSpace. 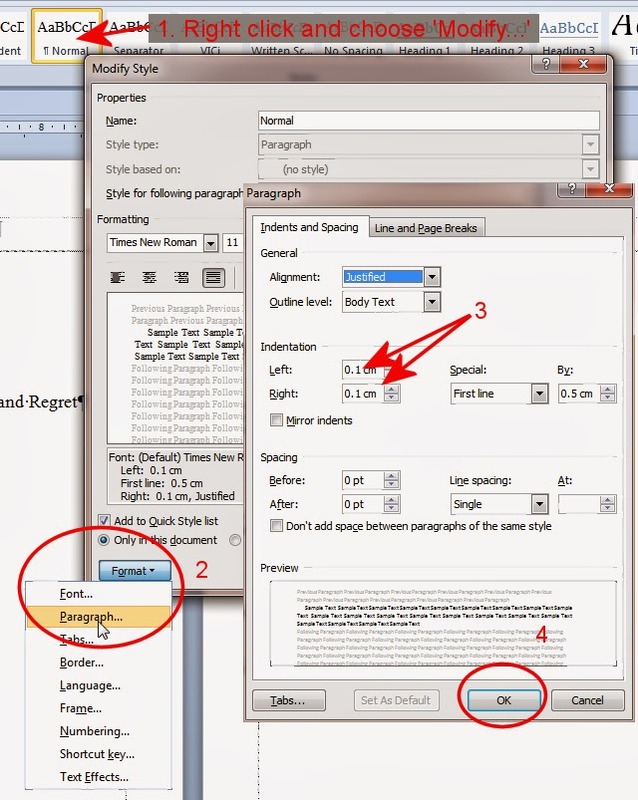 Word allows italic text to overflow slightly into the gutter and CreateSpace will reject this.